FOXNEWS BIll Shine: "Fox News never agreed to allow the Cincinnati Tea Party organizers to use Sean Hannity’s television program to profit from broadcasting his show from the event,"
Angry Fox News executives ordered host Sean Hannity to abandon plans to broadcast his nightly show as part of a Tea Party rally in Cincinnati on Thursday after top executives learned that he was set to headline the event, proceeds from which would benefit the local Tea Party organization. Rally organizers had listed Hannity, who is on a book tour, as the headliner of the four-hour Tax Day event at the University of Cincinnati. The rally, expected to draw as many as 13,000 people, was set feature speakers such as “Liberal Facism” author Jonah Goldberg and local Tea Party leaders. Participants were being charged a minimum of $5, with seats near Hannity’s set going for $20, according to the Cincinnati Enquirer, which reported that any profits would go to future Tea Party events. Media Matters for America noted that Hannity’s personal website directed supporters to a link to buy tickets for the Cincinnati rally. 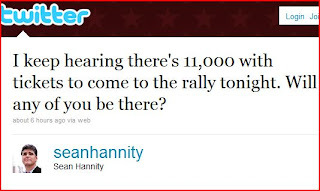 But senior Fox News executives said they were not aware Hannity was being billed as the centerpiece of the event or that Tea Party organizers were charging for admission to Hannity’s show as part of the rally. They first learned of it Thursday morning from John Finley, Hannity's executive producer, who was in Cincinnati to produce Hannity's show. "Tea party organizers told the crowd that Hannity had a "personal emergency." Cincinatti Tea Party Spokesman Justin Binik-Thomas later said organizers were hearing conflicting information, but said admission fees that started at $5 were meant to cover the event's costs and the party wouldn't even break even. 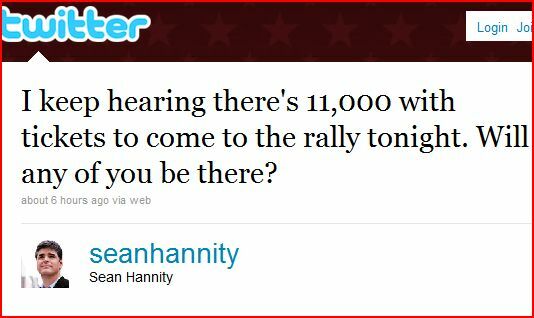 At least 7,500 tickets were sold, including some 2,000 at $20 each for seats near Hannity"
Criticism that the Tea Party and Hannity were trying to make a profit from the event began bouncing around on blogs, including the media blog Media Matters, about two days prior to Thursday’s rally at the University of Cincinnati’s Fifth Third Bank Arena. Cincinnati Tea Party officials said the idea that they would make money on the event is false.“The Left drove that story, Fox capitulated to it and left,” said Chris Littleton, a Cincinnati Tea Party spokesman. He criticized Fox for not coming to Tea Party if it had concerns.Hannity’s show spent about $100,000 to come to Cincinnati, Littleton said. From Instapundit: "The Cincinnati Tea Party folks tell me that they had no deal with Hannity — he had a deal with the University of Cincinnati, and they had a deal with the University of Cincinnati, but there was no deal between them"